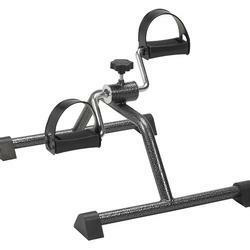 SpinLife is your number one source for exercise equipment. We carry all the top brands including Saratoga and Endorphin. With expert advice and a low price guarantee, we promise you'll get the right piece of exercise equipment at the best price. With similar benefits as a stationary exercise bicycle, pedal exercises are extremely portable and take up little space; about the size of a desk chair. With economic models to higher-end models which feature screens that display information about your workouts, Spinlife has the right pedal exerciser for you. For peace of mind with long walks around the park or farmer’s market, check out our selection of outdoor walkers. 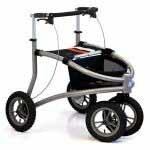 Spinlife carries a selection of walkers designed specifically for outdoor use by Trionic. With front-climbing wheels to handle bumps and curbs, reflective strips and ergonomic grip bars, our selection of outdoor walkers meets a wide variety of needs. Spinlife features treadmills that are designed for those recovering from an injury or surgery, as well as for those who want to run at up to a 15 mile per hour pace. Whether you need something with a slower pace or something faster, we have you covered. 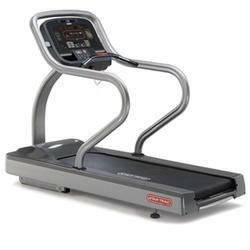 Stay active with Spinlife’s selection of treadmills. An Upper Body Ergometer (UBE) is an upper body workout machine that actively engages almost every muscle in the upper body. A UBE provides similar workouts to that of an exercise bike with the lower half, and has the same cardiovascular benefits found in a standard exercise cycle. It can be used as a warm up for strength training, as well as for a solid core workout when in the standing position. A UBE is also great for those working on physical rehabilitation or users who are in a wheelchair. Upper and Lower Body Ergometers have all the benefits of a typical Upper Body Ergometer, in that they provide almost complete muscle engagement with upper body workouts, as well as cardiovascular and body core benefits similar to a cycle. Upper and Lower Body Ergometers also feature similar benefits of a typical stationary bicycle, adding to a total body workout. 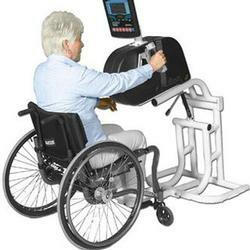 Upper and Lower Body Ergometers are beneficial for those going through physical rehabilitation. 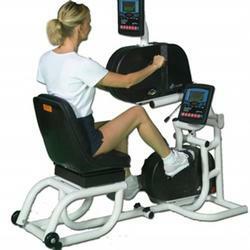 Exercise equipment tables are used in tandem with pedal exercisers or upper body ergometers. For users who are in wheelchairs, the table is height adjustable and allows the user to actively engage in the workout, without putting negative strain on the body. With models featuring standing positions, there’s an exercise table to accommodate almost any need. Maybe your doctor told you that you needed to get some more exercise or you are recovering from surgery or an injury that prevents you from engaging in your regular exercise regimen. At SpinLife we have a selection of exercise machines from a simple tabletop peddler to more advanced equipment for a complete workout. 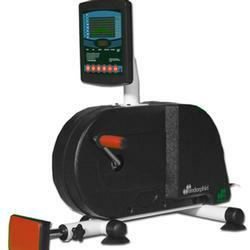 A pedal exerciser is a great alternative to a stationary bicycle. Many give you the option of exercising either your upper or lower body. Use it tabletop or on the floor to improve your circulation while toning and strengthening your upper and lower body. Pedal exercisers are also a great way to sneak in some exercise under your desk at work or while watching television. An Upper Body Ergometer (UBE) engages virtually every muscle in the upper body, in a similar fashion to an exercise bike for the lower body. And in terms of a cardiovascular workout it offers similar benefits to a cycle. As a warm-up for resistance training, it provides better activation of the upper torso than the traditional alternatives. When used in the standing position, the UBE engages all core muscles of the mid section. It is also widely used as an aid to the rehabilitation of many injuries and as a general exercise apparatus for those in wheelchairs. Most items in this category are "bells and whistles" and are not covered by Medicare. A few items, very few, might possibly be considered medically necessary. If you think your purchase might be the exception, let us know and we'll review it. SpinLife is required to collect sales tax for items shipped to certain states. Please click here: Sales Tax Info to see if your state is on the list. SpinLife is here to support you throughout the life of your purchase. We honor all manufacturers warranties. If you run into trouble, give us a call and we will get it taken care of. SpinLife wants you to completely satisfied with your purchase. If it arrives and it is not what you thought or does not meet your needs, you are free to return it as long as it is in new condition and the original packaging. The only thing we require is that you pay freight to return the purchased item. Please see our Return Policy for complete details.